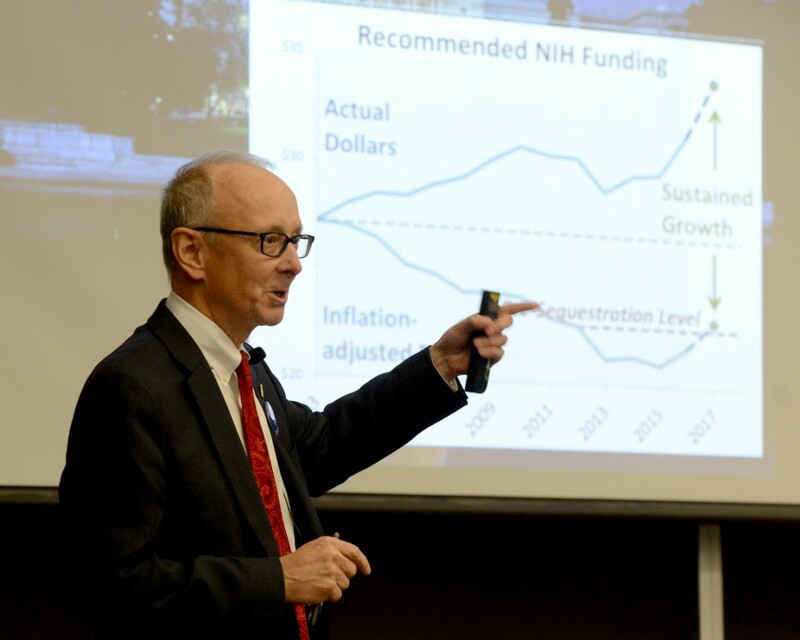 Richard L. Eckert, Ph.D., said funding for the National Institutes of Health (NIH) remains below 2003 levels in inflation-adjusted dollars. By being effective advocates for science funding, researchers can help the U.S. lead the world in science and help their own careers, UAMS students and faculty were told at a recent lecture. “The public does not understand what we do and they don’t understand why we do it,” said Richard L. Eckert, Ph.D., from the University of Maryland, School of Medicine, where he is a professor and chair of the Department of Biochemistry and Molecular Biology. The Sept. 27 lecture was sponsored by the Office of Interprofessional Education and the College of Medicine Department of Biochemistry and Molecular Biology. Whether talking to family or friends at a party, the importance of science and the threats to funding must be communicated clearly. He noted that the U.S. share of worldwide research and development has fallen in recent years from 35 to 27 percent, while Asia’s share has climbed from 27 to 40 percent. The good news is that Congress has started to increase funding for research, but current funding levels for the National Institutes of Health (NIH) remain below 2003 levels in inflation-adjusted dollars. Funding stability is especially critical in science, he said, because a sudden cut in funding such as occurred in 2013 can sabotage years invested in science programs. Eckert leads delegations of researchers to Capitol Hill in Washington D.C. to speak directly to members of the House and Senate. “In the years to come you’re going to have to increasingly engage with this kind of activity because lots of people are asking for support from government and sometimes budgets are limited so we have to be there and we have to lobby with our congressmen and senators to do things that are in the interest of science progression,” he said. At UAMS, such outreach is led by Maurice Rigsby, J.D., vice chancellor for Institutional Relations.